FF&E coordination and move management services for the build-out of 32,000sf administrative offices including medical records, accounting and finance departments as well as the 13,000sf LAMPP Project at Founder's Plaza. 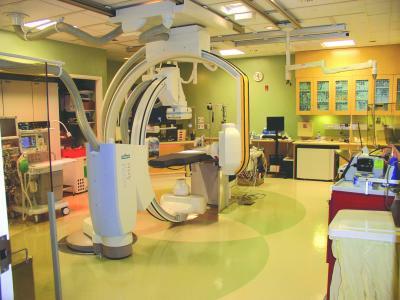 Renovation, design, and build-out of their state-of-the-art 635sf Cardiac Catheterization and Electrophysiology lab at 282 Washington Street in Hartford. The room is equipped with a complex lighting system that allows for better fluoroscopic image viewing using green ambient lighting. 14,000sf medical office build-out in Glastonbury. This facility houses Cardiology, Physical/Occupational Therapy, Audiology w/Hearing Booths, Radiology, Dermatology. Comprehensive on-site project management services for multiple Capital Improvements at the main campus including the expansion of the Neonatal Intensive Care Unit (NICU), Cath Lab replacement, E.D. Triage and Ambulatory Entrance renovation projects.